Grill with indirect heat to make this BBQ Sirloin Roast. 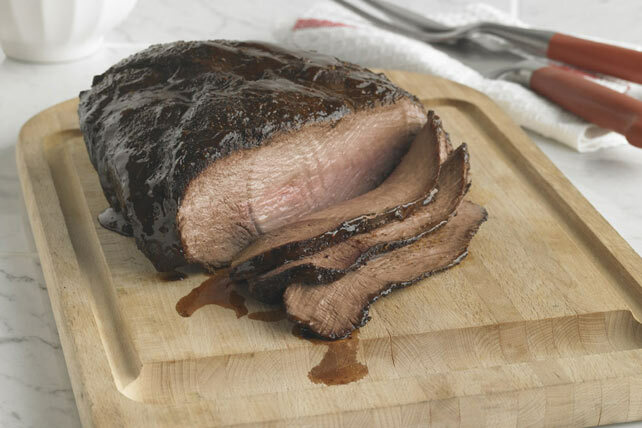 The BBQ Sirloin Roast features a delicious dry rub of black pepper, chili & garlic powder. Heat grill for indirect grilling: Light one side of grill, leaving other side unlit. Close lid; heat grill to 350ºF. Mix seasonings; rub onto all sides of meat. Place meat on grate over unlit area; cover. Grill 1 hour or until meat registers 140ºF when tested in center with meat thermometer, monitoring for consistent grill temperature. Brush meat with 1/4 cup barbecue sauce. Grill 10 min. or until meat registers 150ºF. Transfer meat to carving board; tent with foil. Let stand 10 min. or until medium doneness (160ºF). Cut meat across the grain into thin slices. Add to remaining barbecue sauce in large bowl; toss to coat. Heat grill to medium heat. Place seasoned meat on greased grill; cover. Grill 40 min. or until internal temperature of meat registers 140ºF, turning every 15 min. Remove 1/2 cup barbecue sauce; place in large bowl. Brush 2 Tbsp. of the remaining sauce onto meat. Grill 5 min. Turn meat over; brush with remaining 2 Tbsp. sauce. Grill 5 to 10 min. or until internal temperature of meat registers 150ºF. Continue as directed. Use a carving board with an indentation or "trough" to catch the juices from the roast as it is carved. Mix juices with the barbecue sauce before tossing with the sliced meat.